Do you want to really learn how to assess and identify individuals with dyslexia effectively, sensitively and individually? Associate Membership of the Dyslexia Guild (ADG), or British Dyslexia Association Approved Teacher Status (ATS) or Approved Practitioner Status (APS) then Dyslexia – Professional Report Writing is your gateway to the SpLD Assessment Practising Certificate (APC). 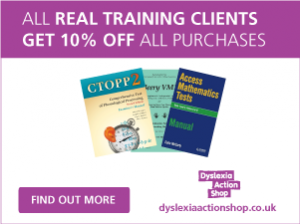 Gain the professional advantage with the only dyslexia assessment study programme to have been developed by leading educational psychologists (EPs) in partnership with teaching professionals. 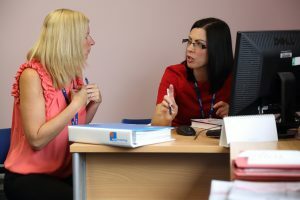 If you are looking for a course on early intervention and working with groups of children, then the Dyslexia – Leadership and Intervention module may be a better fit for you. Learn exactly how to assess individuals who may have dyslexia. Take a unique SpLD Assessment Standards Committee (SASC) approved course designed by EPs and teachers in partnership. Access the gateway module to the SpLD Assessment Practising Certificate (APC). Gain 30 credits and count them towards a PGDip, PGCert, or an MEd in SEND. Choose this recognised path to the SpLD APC – awarded by either the Dyslexia Guild, PATOSS or the British Dyslexia Association. If you want to be a specialist teacher, you simply need to complete the three unique steps illustrated below to gain your APC. Secondly, you need to successfully complete CCET or CPT3A (which you can take with us). Finally, you need to complete this module. You will be eligible to apply for an APC as soon as you successfully complete these three elements. Why do specialist teachers need the SpLD APC? An APC is a recognised licence to practise for specialist teachers/assessors. It confirms that the specialist assessor has the appropriate qualifications to undertake full assessments for dyslexia/SpLD to provide evidence to support an application for the Disabled Students’ Allowance (DSA). It also confirms that specialist teachers/assessors have kept their professional practice up-to-date and that their practice has been externally verified as continuing to meet defined competence standards. You might also wish to combine this module’s individualised assessment approach with our sister Dyslexia Leadership modules to gain an invaluable joined-up understanding of the needs of pupils, classes, schools and organisations. Gain a deeper understanding of dyslexia and the real needs of dyslexic students. Identify individuals who require additional support. Produce and use a rigorous, evidence-based framework for assessment and reporting. Foster and develop knowledge and skills that enable you to create a clear learning path for those with dyslexia, based on a holistic analysis of their strengths and key areas for future development. Put yourself in pole position to apply for the SpLD Assessment Practising Certificate (APC). Understand the key dyslexia assessments that need to be used to help each individual. Further develop your understanding of specific learning difficulties with a focus on dyslexia. Develop dyslexia assessment tools that enable you to write reports to the APC standard. Significantly enhance the quality of your assessment of each individual, whether or not each assessment leads to a diagnosis. Obtain a comprehensive understanding of the academic debates in this area, changes in relation to definitions and terminology over time and the role of discrepancy analysis. Familiarise yourself with the key components of a rigorous and professional dyslexia assessment. Put your enhanced conceptual understanding of dyslexia into practice. Learn how to conduct a full professional assessment and make the best possible judgement. Develop your broader practice, knowledge and skills through reflection. Explore aspects of your own and others’ practice using theories, reflection and activities to help you. Access our sophisticated online learning platform and utilise the latest technologies: video and multimedia content, access to two thousand full-text journals, case studies and problem-based scenarios, directed reading, structured learning logs, online discussion, online questionnaires, peer evaluation, student forum and occasional webinars (with tutors and guest lecturers). This course is part of our MEd and SEND Programme. It is designed, delivered and assessed by Real Training and quality assured and awarded by Middlesex University. Attain 30 Masters-level (M-level) credits when you successfully complete this module. Get 180 credits and the MEd is yours. Obtain a PGCert or PGDip by combining this module with our other modules, including Dyslexia: Leadership and intervention. Work with a professional tutor and receive dedicated support from the module team – made up of experienced EPs and specialist teachers with an APC and AMBDA. Critically explore the history and concepts behind specific learning difficulties with a primary focus on dyslexia and co-occurring conditions such as dyspraxia and ADHD. Focus on synthesising information from the literature and research in this area from professional publications and guidance relating to the understanding of SpLD and its assessment. Create a timeline outlining and summarising the most significant publications, developments and changes in dyslexia; while also considering the impact and implications of these progressive developments on your understanding of SpLD in teaching and learning. Take part in lively critical discussions on SpLD via our interactive forum in Campus OnlineTM. Start to create an assessment checklist consisting of a list of key questions that an SpLD assessment must address. You will develop this throughout the module and it will form the basis of a comprehensive assessment that takes into account a broad range of factors relevant to the identification of dyslexia. Consider the important components of a rigorous and professional dyslexia assessment, enabling you to put into practice the conceptual understanding of dyslexia that you gleaned from the first strand. Consider the use of psychometric tests and a range of wider assessment techniques, including ability, attainment and diagnostic tests of specific cognitive skill. Undertake a focused evaluation of two tests and consider their particular contribution within a dyslexia assessment. Examine the statistical analysis of test data and critically consider the notion of statistically significant differences between test scores. Refine the assessment checklist that you started in the first strand and consider and notes down the appropriate tools and assessment procedures for answering the questions that you have formulated. Consider the meaning and interpretation of a set of given test results provided as a case study on Campus OnlineTM; discuss your interpretation with other delegates in the discussion forum. Complete a multiple-choice questionnaire testing the accuracy of your statistical analysis of test data. Compare and contrast existing professional dyslexia reports, evaluating their approach, style and content. Consolidate the skills and knowledge that you gained in the first and second strands in the consideration of the wider factors involved in conducting a full professional assessment and in making good judgements. Reflect on your developing practice, knowledge and skills. Draw up a plan for a full dyslexia assessment – gather background information; consider specific hypotheses and questions that inform the assessment; consider issues of confidentiality and data protection; clarify the purpose of and rationale for the assessment. A written assignment analysing and critiquing the history of identification of dyslexia including the discrepancy model (1,500 words). A case study analysis, for which background information and test results are provided (1,500 words). Three written example reports (2,500 words each) stemming from a full SpLD assessment, outlining the rationale and evidence for the identification of a specific learning difficulty. A short learning log of practice change over the duration of the module and comparative analysis of pre- and post-module style and skills (500 words). Two video submissions (DVD or file upload) demonstrating competencies in the direct assessment of a client. Study with some of the finest practitioners around. Engage with outstanding content and practical activities that truly enhance your professional development. Either Associate Membership of the Dyslexia Guild (ADG), a British Dyslexia Association accredited Approved Teacher Status (ATS) or Approved Practitioner Status (APS) qualification. Completed, or be enrolled on the Certificate of Competence in Educational Testing (CCET). Registered or be on course to register for the British Psychological Society’s (BPS’s) Register of Qualifications in Test Use (RQTU) and either have gained/be on track to gain the BPS’s Test User Educational qualification. Demonstrated that your registration has been maintained if you have already attained the BPS’s Test User Educational qualification. Work in or have access to an education setting. Have access to a wide range of psychometric tests. Please note that in order to complete this module you will require access to a wider range of psychometric tests than that used for CCET. The fee for this module is a little more than our other 30-credit modules because we include even more professional tutoring and the course is approved by the SpLD Assessment Standards Committee (SASC). Speak to us (01273 35 80 80) or make a booking.